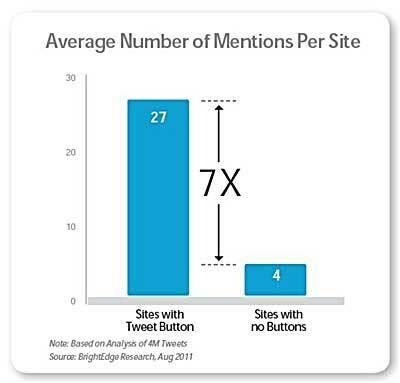 Websites that display Twitter sharing buttons are linked to on Twitter nearly seven times more often than sites that do not display tweet buttons, according to a study by BrightEdge of some 4 million randomly sampled Twitter messages in August 2011. Among the 10,000 largest websites, those that feature Twitter share buttons were, on average, mentioned in 27 tweets that contained a link back to the site, whereas those not featuring tweet buttons were mentioned on average in four tweets that contained a link back to the site. Below, additional findings from the September issue of the BrightEdge SocialShare Analysis.